A man was shot and killed in Bellflower Sunday, but it is not clear what led to the shooting, Los Angeles Sheriff’s investigators said. 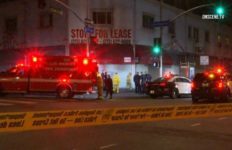 It occurred at 12:35 a.m. on the 17100 block of Downey Avenue, according to Deputy Tracy Koerner of the Sheriff’s Information Bureau. The man was pronounced dead at the scene, she said. Soon after the shooting was reported, Lakewood Sheriff’s deputies ask the California Highway Patrol to shut down the Downey Avenue offramp on the westbound 91 Freeway during the investigation. A SigAlert was issued at 1:31 a.m. for unknown duration. The suspect was described as a male Hispanic who was last seen wearing a gray or silver hoodie in an area just north of the 91 Freeway between Downey Avenue and Lakewood Boulevard, CHP officials said. Anyone with information about what happened was asked to call the Los Angeles County Sheriff’s Department’s Homicide Bureau at (323) 890-5500. Anonymous tips can be left with Crime Stoppers at (800) 222-8477 or at lacrimestoppers.org.